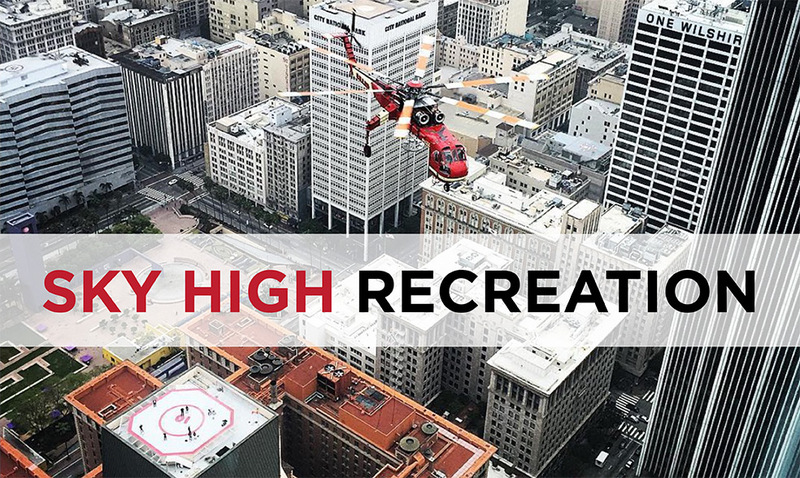 Sky High Recreation | Siller Helicopters, Inc.
On March 19, Siller Helicopters helped bring the people of Los Angeles a bit closer to the sky. Perched more than 1,000 feet above city streets, the newly installed “Skyslide” offers a breathtaking bird’s-eye view of the city as riders launch themselves from the U.S. Bank Tower’s 70th floor. The slide, measuring 45 feet long and constructed entirely of 1 ¼-inch glass and steel framing, is an engineering marvel, providing adventurous users with panoramic views as far as Catalina Island, more than 22 miles off the Pacific coast, before delivering them safely to the open-air observation deck below. Yet, raising the 12,000-pound structure into position on the precipice of the tallest skyscraper west of Mississippi was a logistical feat in itself. The dense urban environment of downtown Los Angeles and staggering height of the US Bank Tower presented the building owner with limited installation options. Too tall for a crane, and mechanically unable to be assembled at the elevated jobsite, the the slide’s only remaining route was airborne. As the area’s leading heavy-lift provider, Siller Helicopters was contracted by slide manufacturer Steel City Glass to help the Skyslide earn its lofty title. Planning for the operation began more than a year ago. Due to the Skyslide’s unique shape and weight distribution, extensive preparation was needed to ensure the lift was successful. Numerous operational tactics were considered, analyzed, modified and physically tested before the final plan was put into action. In June 2015, a full-scale wood replica of the slide was built. This mockup was used to test the characteristics of the load. 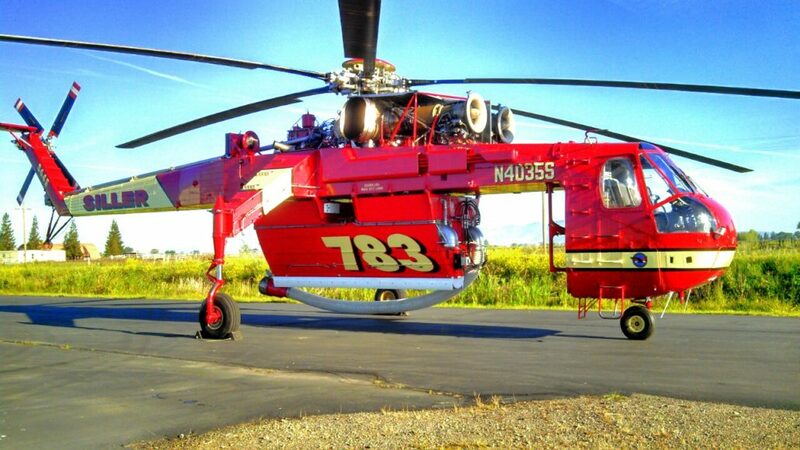 Based in nearby Hemet-Ryan Airport, the S-64E Skycrane conducted initial practice lifts to determine the aerodynamic tendencies of the rotor down wash on the slide. This data is used to adjust the Skycrane’s unique anti-rotation system rigging, which controls the spin of external loads. A second test was then conducted in January 2016 at Siller Helicopter’s Yuba City, CA., headquarters. 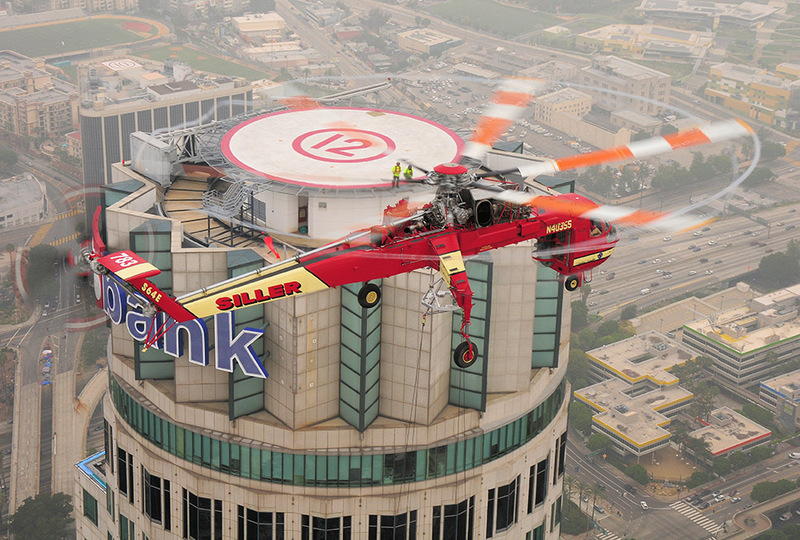 Using a steel frame fabricated to match the Skyslide’s weight and dimensions, the Skycrane crew and Steel City Glass installers practiced landing the Skyslide mockup in a simulated area matching the dimensions of the 69th story U.S. Bank Tower platform. 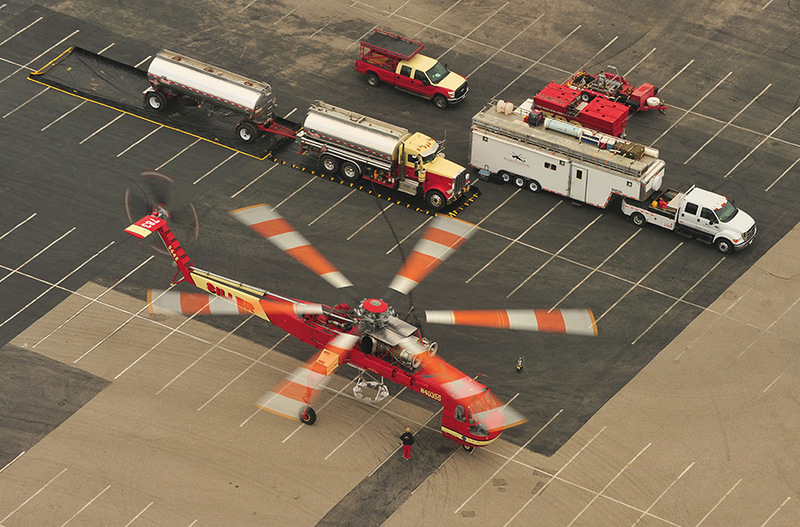 This lift helped familiarize the installation crew with heavy-lift helicopter operations, ensuring all parties were trained in procedural and safety protocols, ultimately minimizing the risk to onsite personnel, bystanders, payload and the building itself. 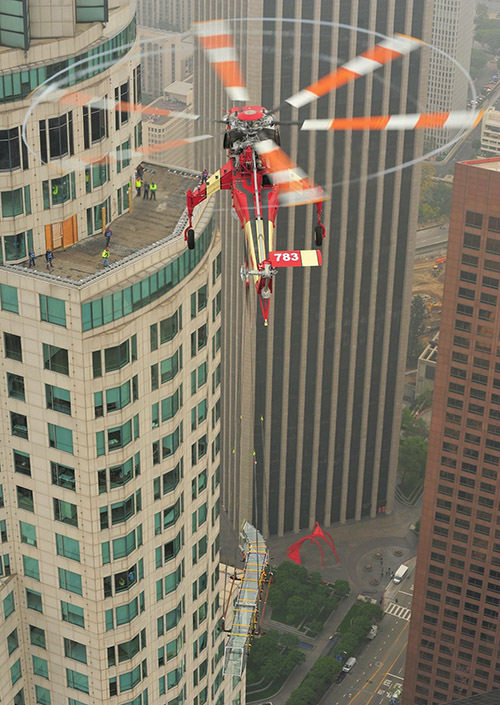 Taking off from nearby Dodger Stadium, a fully-crewed Siller S-64E Sikorsky Skycrane flew to the lift site at the base of the U.S. Bank Building. The complicated nature of the lift, and several adjacent flight hazards, meant that all three crew positions: Chief Pilot Roger Douglass, Command Pilot Bill Neckel and Aft-Pilot Fran Tebbe, were necessary to complete this job safely. Absolute precision was required due to the limited size of the 20 ft. by 50 ft. landing area, and special anti-rotation rigging was used to minimize the slide from swaying and potentially colliding with the side of the building. To help assist the aft-pilot with positioning the load, 125 ft. tag ropes were employed to mark the touchdown point before the load made contact. Using this extensive custom rigging, the glass slide was the lifted more than 1,000 feet in the air to the target elevation just above the 72nd story rooftop. 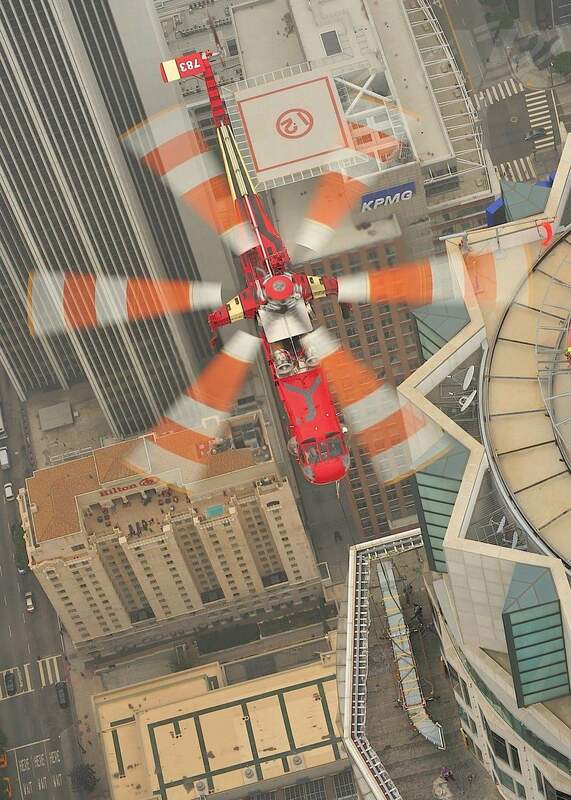 Nearby Siller radio crews led by Project Manager Marc Boyle began directing the Skycrane pilots as they carefully lowered the slide down to the ledge platform, calling out vertical and horizontal adjustments to accurately gauge both the helicopter and load position. Combining the full efforts of Siller personnel, the Skyslide was secured into place and disconnected from the harness, allowing the helicopter to return to base and the slide’s final installation efforts to commence. A year of planning, dozens of hours of testing, and the highly-coordinated efforts of more than 15 pilots, ground crew and support staff went into ensuring that a single 30-minute operation was completed safely and successfully.